Mr. Mioduszewski practices exclusively in civil litigation, with emphasis on fire and explosion litigation; public utility liability; products liability; construction litigation; nursing home liability; and municipal and governmental liability. 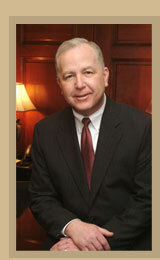 He also practices in the areas of automobile and premises liability. He was initially certified by the National Board of Trial Advocacy (NBTA) as a Civil Trial Advocate in 1992 and has been re-certified in 1997, 2002, 2007 and 2012; he is also certified by the NBTA as a Certified Civil Pretrial Practice Advocate. He is a member by invitation of the International Association of Defense Counsel. In 2006, he was appointed as a Hearing Committee member serving the Disciplinary Board of the Supreme Court of Pennsylvania. Mr. Mioduszewski is peer review rated AV, or preeminent, in the Martindale Hubbell Law Directory and has been selected in nine years by Law & Politics and Philadelphia Magazine as a Pennsylvania Super Lawyer, based upon statewide polls of practicing lawyers to identify colleagues who are considered to occupy the top 5 percent among fellow practitioners. A 1979 graduate of the University of Pittsburgh School of Law, Mr. Mioduszewski is admitted to practice before the Pennsylvania Supreme Court, the United States Supreme Court, the United States Courts of Appeals for the Third Circuit, and the United States District Court of the Western District of Pennsylvania. He regularly appears before the Courts of Common Pleas of Erie, Crawford, Mercer, Venango, McKean, Potter, Elk, Beaver, Clarion, Jefferson, Cameron, Indiana, Westmoreland, and other counties in Western Pennsylvania as well as before the appellate courts of Pennsylvania. Mr. Mioduszewski has authored texts on a variety of subjects affecting civil liability, including: Joint Tortfeasor Releases: Their Theory and Practice in Pennsylvania; Spoliation as a Shield and a Sword: When it Pays to be a Pack Rat; Jury Selection and Voir Dire; Nursing Home Liability; Fire and Explosion Investigation and Litigation; and others. He has made presentations and participated in seminars on these and other subjects before a variety of professional organizations, including the Erie County Bar Association and the Pennsylvania Claims Association, and his presentations have been approved for Pennsylvania Continuing Education credits. Mr. Mioduszewski served for three years as the President of the Erie Youth Hockey Association, which serves 700 children ranging in age from 5 to 17 years old who play amateur hockey in Northwestern Pennsylvania, and for two years as the President of Cathedral Prep Hockey Club. He similarly served for two years on the Board of Governors of the Pennsylvania Interscholastic Hockey League (PIHL), where he was a member of the Scholarship Committee. He has also served as President of the Villa Maria Advisory Board; as Treasurer of Erie Hotline, Inc., and as a member of the Planning & Allocations Division of United Way of Erie County, where he chaired allocations panels for youth services agencies.